Financing or refinancing your new or used equipment with Farm Bureau Bank has never been easier! Our loans are designed to get you the equipment you need now so your business can continue to run smoothly. Please select your Equipment Loan Financing Amount to proceed. 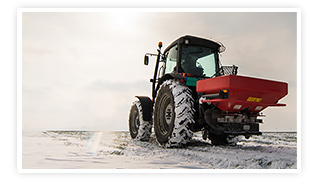 Equipment: Farm, Tractors, Bulldozers, Forklifts, Plows, Skid Steers, Livestock Trailers and Lawn Equipment. Other equipment may apply. Call for details. Down payment may be required for new or used equipment purchases. One year of financial information is required for loan requests of $100,000 to $149,999 and two years of financial information is required for $150,000 and over. Financial information shall consist of your latest personal tax return(s) and a completed Personal Financial Statement and schedule of your debts. Additional supporting financial information may be required. If the loan applicant is a corporation, LLC or partnership, please provide the respective tax returns for the entity. Please make note of any extenuating circumstances that might reflect substantial changes to current income from the prior year. Commercial vehicles and trailers may be subject to an additional documentation fee. Payment plan subject to qualification and approval.